Have the White Supremacists Left Charlottesville? The city has a reputation as a liberal oasis in the South. But racism is homegrown here. Charlottesville, Virginia, presents itself as a liberal enclave within a much less hospitable South. On a City-Data forum responding to the question, “Is Charlottesville good for liberals and good for young families?,” one person wrote: “If you want a hip, liberal vibe, stick…to Charlottesville—a little oasis of blue in a sea of red.” Eighty percent of the city voted for Hillary Clinton in November’s election. It’s a college town. Next to the campus there’s a yoga studio and a juice bar. Down the street is a salad place with a perennial line of health-conscious UVA students extending down the block. In the aftermath of the white-nationalist rally that took place in the city on August 12, restaurants have put up signs of inclusion on their windows. When I visited, in mid-September, it was Pride Week and rainbow flags were all over the city’s downtown mall. Some local new coverage described the Unite the Right rally and the events that transpired afterward as the products of forces external to the city itself—white supremacists who descended upon Charlottesville to protest the removal of Confederate status and push their agenda of ethnonationalism. But as Kristin Szakos, a city councilor in Charlottesville, told The New York Times’s “The Daily” podcast, “We would be wrong to think that before the discussion about the statues came up that everything was fine.” She added, “Some of the wounds from before the Civil War, some of the wounds of slavery have never fully healed. It’s like a bone that’s not been set right.” A closer look finds that the city does not need to look beyond itself to find white supremacists, to find white supremacy. Despite the city’s liberal reputation, it lurks implicitly inside the restaurants that proudly wave rainbow flags and boast inclusion—and then it’s more explicit, too. Last Monday afternoon, all you could see of the oxidized Robert E. Lee statue just a block from the city’s downtown mall was a vague idea of its shape. The City Council voted on August 22 to cover the statue, a little over a week after the Unite the Right rally. Lawsuits over the the statues’ total removal have the city waiting, and tarps were a temporary fix. But in the darkness of night, the tarp was ripped down, just hours after Columbia Journalism Review held a panel discussion (of which I was a part) on race and racism in news coverage of the Unite the Right rally and the events that surrounded it last month. 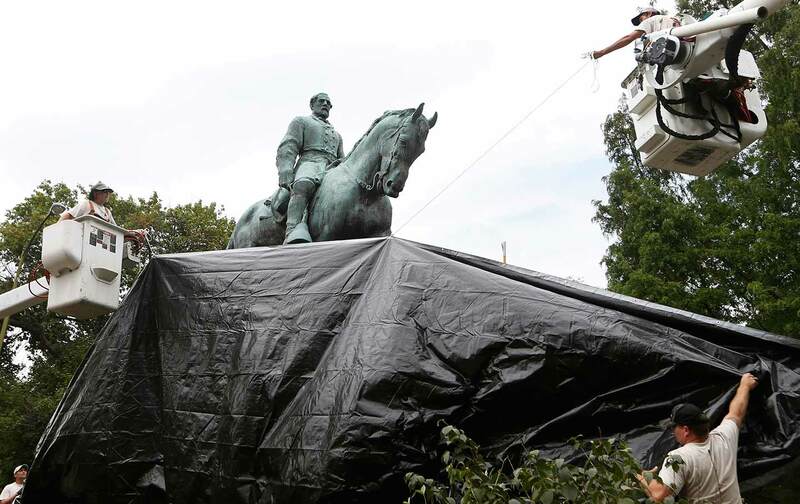 Since the monument was covered up with black tarp, almost two weeks after white supremacists came en masse to protest in Charlottesville’s Emancipation Park, the tarp has been taken down at least six times. Last Monday evening, the group who tore it down was led by Jason Kessler, a local white nationalist and organizer of the Unite the Right Rally. He wasn’t alone. According to the Southern Poverty Law Center, Kessler was formerly involved in the Occupy movement, but shifted his views some time in 2013. In 2017 Kessler launched a white-nationalist website called Unity & Security for America (no longer functioning), which described itself as “a revolutionary right wing grassroots movement.” On May 14, Kessler took part in a rally led by Richard Spencer where white nationalists held torches to protest the Charlottesville City Council’s decision to take down the statue of Confederate Gen. Robert E. Lee. It was a precursor to the larger Unite the Right rally that would take place three months later. The city told The Cavalier Daily that it has spent $5,000 on replacing the shrouds that have been taken down by white supremacists since they were first put up to cover the Confederate memorials. On September 19, the City lined the statues with plastic fencing to prevent vandals from climbing up and removing the shrouds. “Removing the tarps will not be tolerated,” Szakos told a local NBC affiliate. But enforcement is lacking. “The commonwealth’s attorney’s decision not to prosecute for vandalism when people were taking the tarps off made it really difficult,” said Szakos. Local activists are not satisfied with the tarps, either. “The tarps don’t help. It’s still erected, it’s still in view of people,” said David Straughn, a Charlottesville resident. An actor, comedian, poet, and musician, Straughn is also active in local racial-justice organizing. Discrimination has a recent history in housing too. In the mid-1960s Charlottesville’s mostly black neighborhood of Vinegar Hill was razed. “The city justified the razing, which it called ‘urban renewal,’ because many houses didn’t have indoor plumbing and weren’t up to code. The city paid homeowners a fair market value and provided moving costs to 140 black families and 29 businesses, most of which were black-owned and forced to permanently close as a result,” he wrote. Nowadays, there are very few black-owned businesses in Charlottesville, Yager said during the panel discussion hosted by CJR. As for the monuments themselves: “They will only continue to bring acts of violence of intimidation, they will embolden white supremacy,” said Straughn. “No matter how you label it: ‘Confederate service,’ ‘love of country,’ it’s only going to bring more blood in the streets and murder,” he said. “A tarp isn’t going to solve our problems.” Last week a flimsy fence was erected to keep the white supremacists out. But also present is the stealthier form of white supremacy, the one that pushes black people out of the city limits, the one that arrests black youth disproportionately to their white counterparts. The Unite the Right rally might be over—but white supremacy has not left Charlottesville.